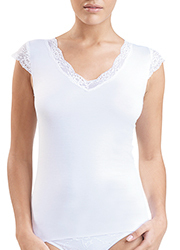 Aura is a simple and elegant everyday camisole, perfect for wearing under your blouses and tops. With a narrow length of lace around the edge, it is more than just a simple undergarment, having more of its own identity and being ideal for pairing with nearly anything. Aura is pretty but practical, simple yet beautiful.